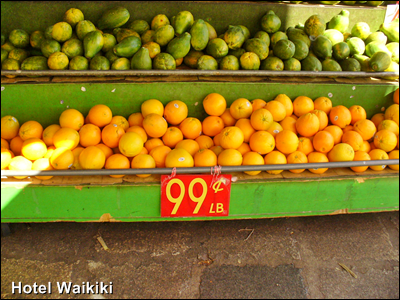 HOTEL WAIKIKI: Oranges, and Casey Anthony. I forgot to mention that the oranges pictured in Sunday's post were lush inside. The Chinatown proprietor lets the oranges ripen in the sunlight. Well, at least, where the rack with the oranges on top of it, the rack, is setup outside exposed to sunlight unlike the supermarket fruits and vegetables basking in artificial light indoors ripening on the vine under a coat of paste wax. I picked out four oranges, the best of the lot, with not a single blemish mark from customers squeezing them for reason known only to their circle of connoisseurs, but when the bunch rung up to almost a whopping $4.00, I told the proprietor to take two of the oranges back, that my wallet only desired two oranges. That would have been almost an entire $1 bill per individual orange even at a lowly 99¢ per pound. I surmise that's due to the water content. Just like bananas. Ever rung up a bunch of bananas? Same thing. Of course I had no way of knowing at the time that the oranges sported USDA meat under their skin. I don't necessarily mean the best tasting oranges that I've ever ate on the planet, but the full body-ness. At any rate, the thing I most appreciate shopping at a Chinatown store is that they just want to sell you the merchandise, and they wouldn't be any happier whether the customer happens to be Joe the Plumber or Mr. Famous Person. That's a mutual since all I want is to buy the same merchandise. Thusly, things always worked out for me in Chinatown. The Fourth of July was a NO-INTERNET day for me. A holiday in its own right. Does that make any sense at all. Yea, it does if you remember....the Internet makes you stupid. Anyways, the only tv that I did watch was the local news because the usual nothing but 24-hour news channels that I normally watch, had wall to wall coverage of the Casey Anthony case ad nauseam even though the jury was deliberating behind closed doors and the courtroom itself was empty. Casey Anthony was declared not guilty. Despite what you believe is the truth, there was no circumstantial evidence that tied Casey to the murder. To convict Casey of murder, would be tantamount to designating the prosecution as the beneficiary of the beyond a reasonable doubt rule. That's not the way it works in the USA. Just ask O.J. Simpson. Micheal Jackson. Anyways, a higher court would have reversed a guilty verdict on appeal. A legal expert on tv said that the prosecution got greedy. If the prosecution had sought a somewhat lesser charge of manslaughter, there would be six jurors without a lethal injection closure. A murder trial requires 12 jurors. You know... I just never know with fruit. I was getting good stuff from Costco and then wham, crap clementines and grapes. They looked good, but yuck. I've been hearing quite a bit about the Casey Anthony case too. I don't understand why that was SUCH a huge deal over all the other murder cases in the U.S. I find your point of view very interesting since I've heard mostly only outrage. I haven't followed the case, so I don't have a knowledgeable opinion. I know exactly what you mean about the Chinese merchants. They just want to sell. And Chinese merchants don't mind if you tell them things are too expensive, etc. They will accomodate you if they can, but if they can't, well, there is always another customer. I think the Casey Anthony case is one of those man bites dog things, a novelty in the world of criminal justice. Kay- nicely ripened fruits from the mainland are a rare find. I ripen them by tossing them in the microwave and chill them in the refrigerator. All the post trial outrage against Casey has bestowed the media with a second windfall. Still, allowing cameras in the courtroom for high profile cases is overall a positive thing. Hattie- and it applies globally too, with the salesmanship. The Chinese ain't about to put up indefinitely with manufacturing all them consumer goods only to have some other foreign company sell the same merchandise that they are well suited, or even more skilled, to sell directly to the world themselves increasing their profit margin. The Casey Anthony case was a loser for the prosecution from the onset whom gambled on the jury's resentment of the defendent partying, etc, to sway a guilty verdict. Sure, there is definitely something evil about a parent not reporting a kid missing until after a month later, and partying during the same period, but the circumstantial evidence was not overpoweringly strong, and the prosecution knew that well in advance.